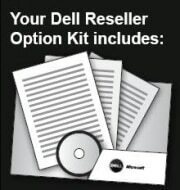 Dell and Microsoft are excited to announce the launch of the Dell Reseller Option Kit (ROK) - a faster, simpler and more profitable way to buy and deploy Microsoft server products tuned and certified for Dell-branded hardware. With Dell ROK you are able to be more responsive to your customers needs and to deliver customised, high-performance hardware and software configurations with greater ease. Dell ROK gives you the opportunity to increase your attach rate on every Dell server, resulting in higher revenue and profit. Purchasing Dell ROK together with Dell-branded hardware is more cost effective than buying them seperately. Dell ROK allows you to order the most common Windows server operating systems separately from Dell-branded servers – reducing the need to carry inventory with preinstalled hardware and operating system configurations. Purchasing is fast and easy as certified stand-alone Dell ROK kits can be bought as another server option – like RAM, memory or hard drives. Tested, tuned, and certified with Dell-branded hardware, your ROK software is packaged with the latest drivers and customized installation tools. In addition to the latest Dell-tested and certified drivers you and your resellers enjoy 90-day hardware and software installation support.